My husband loves this wallet! Super low profile but holds cards and cash like a champ. The leather is great and elastic seems like it will hold up well. Great for carrying ID credit card and a bit of money. We both use for shopping. Attending outdoor venues when walking distances rather than carrying heavy purse or bulky wallet. So well-designed. Also fits my wallet pen. Eliminated a few cards I don't need to carry everyday, and it still fits a lot more cards than thought it would. Pockets are a lot slimmer now, it's light, and easy. Great product. My husband hates wallets, but had too many cards for a money clip. This was perfect- he loved it so much, I bought him a second one in black! My husband always had a magnetic money clip, so I was a little leery buying this one, I'm so glad I did, he loves it. It's so slim and lightweight, and it holds everything tight. Good purchase! 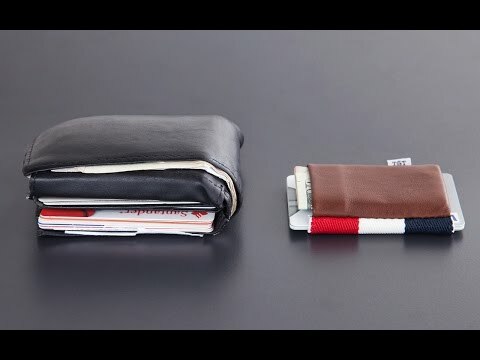 This wallet is truly minimalist, and fits just fine in my front pocket without a significant bulge. The recipient of the wallet loves it. This wallet is the best. My boyfriend LOVES this wallet. He used to use a money clip and when I saw this I thought it may work maybe a little better......but he says it's the best thing ever for the job. Very happy with this product, it delivers as promised. GREAT!!! I kept one. It slips into my sports bra, etc. perfect for traveling on high crime areas. TGT elastic minimalist wallets had their start in a grocery store. Founder Jack Sutter noticed a friend using the rubber band from a bunch of broccoli as a wallet in an effort to reduce bulk in his jeans. Jack, a designer, created TGT—an incredibly low-profile wallet that’s a (significant) sophisticated improvement. Each one is made by local artisans from durable elastic that’s sourced and custom designed on the East Coast. 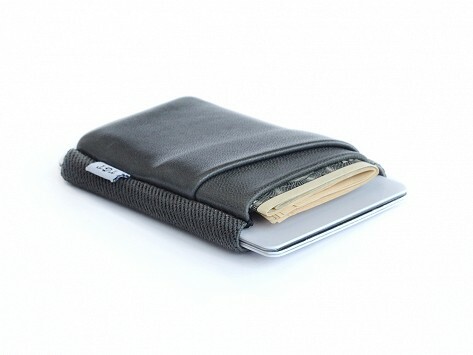 There is a tiny, attached pouch made of ultra-soft, premium leather. Tuck your cards in the band, your bills in the pouch, and you’re ready to go. Since TGT has such a low profile, you can fit it in a back or front pocket and still have room. As a fun side note, the packaging also started in a grocery store; one of Jack’s designer friends created the first prototype out of a cereal box.